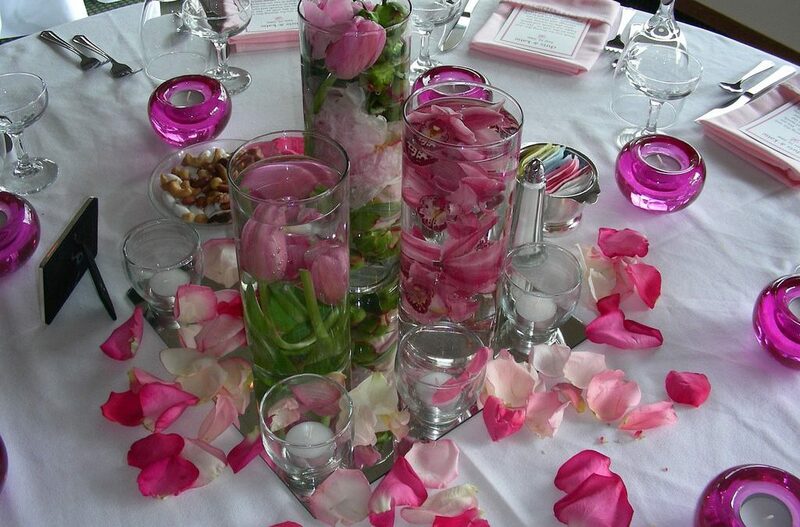 Centerpieces are a huge part of a wedding. They are a crucial element that will bring the entire look of the reception together. For the “Do-It-Yourself” Bride, centerpieces are also a creative outlet- allowing them to put a very personal touch to their reception. At Gala our staff has seen some creative ideas, and stunning centerpieces. We have seen floral arrangements, fruit inspired centerpieces, and even individualized cakes replaced as the décor of the table. For whatever you decide to do, there is no need to break the bank to get an elegant centerpiece. A popular centerpiece that I am going to display today is one that Gala creates for many of guests. This centerpiece can be used for many different events and special occasions. It’s the submerged floral centerpiece with a floating candle. As you can see from the picture above, this elegant centerpiece is simple yet creates a lot of impact. Another plus is that its very easy to design! To create this elegant look all you need are 5 simple items- a silk flower, clear rocks, a cylinder glass vase, a floating candle, and water! Step 1: Take the flower and inserting the flower into the glass vase. Step 2: Add the rocks to the vase. The rocks will secure down the stems of the flower, so that the flower does not float when the water is added. The rocks will also hide the stem for a more attractive look. Step 3: Add water to completely submerge the flower. You want the water to be about ¼ of an inch from the top of the glass. Step 4: Add the floating candle. The centerpiece is beautifully, elegant, and cost effective! A simple mirror and candles can be added to give more of an effect, but if you are looking for a easy centerpiece that is a fraction of the cost of live floral, then consider the submerged silk!